The BOOST project collaboration between English Touring Opera (ETO) and Guildhall School of Music and Drama directly continue the research work funded by their Creative Voucher, Round 4 collaboration. The initial research highlighted that audiences for opera in cinema were largely positive about the extra footage and backstage interviews in ETO’s online broadcasts because audiences enjoyed having access to things they could not normally see in the theatre, and insight into the “real people” connected with the show. 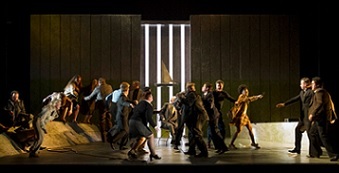 While English Touring Opera also produces video interviews, podcasts, pre-show talks and other supporting materials to enhance audience experience of their productions, these are not as seamlessly integrated into the overall experience when compared to the cinema broadcasts, and initial conversations with audience members indicated that many do not access these materials. The aim of the BOOST project, therefore, was to make these materials appeal more broadly, rather than just for highly-engaged opera enthusiasts, and make sure they reach the widest possible audience. 1. What kinds of materials would enhance the audience experience of their performances and make repeat attendance more likely? 2. What media are most effective for providing these materials, given both their lack of access to audience data from venues and the low levels of digital engagement of some older audience members? Informed by the research results, ETO has been able to revise its content and digital marketing strategy to better tailor its content production to the wants and needs of its audiences. ETO has also been in talks with a web agency to develop a mobile app to streamline and enhance the delivery of its online content to existing and new audiences. The app, which was partially funded by CWL through the Boost Award, will be beta-tested at ETO’s Autumn 2016 opening performances at Hackney Empire in London. As a result of the BOOST funded research conducted by GSMD, ETO have a clearer picture of audience response to their supporting materials. A data comparison from the Spring 2015 and Spring 2016 seasons revealed that at the same point in 2016 the ETO supporting material had been accessed more than five times as much as in 2015. ETO have now been able to create a new strategy for both the creation and delivery of the supporting materials, which will drive their business forward by allowing them to appeal to new and larger audiences, and better retain existing ones in the face of competition.